are the tombs of the Deer Headed Kings. Tonight the moon rises behind a red maple. Tonight the stars bathe the air in stellar light. and step with bare black feet upon the snow. of their families and homes. They wrap robes around themselves, shivering in the cold. A disturbed mutter; the chatter of teeth. “The stars are getting quieter,” says another. Tanner S. Abernathy is a writer and youth mentor living in Bellingham, Washington. His poetry has appeared on display at the Sue C. Boynton Poetry Contest reading. He organizes local art shows and poetry readings for his community hosted in his home. 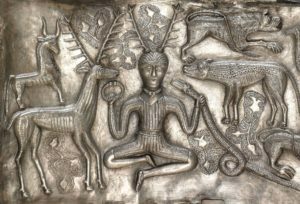 Editor’s Notes: Though not necessarily associated with this poem, Cernunnos is a mythological figure in Celtic mythology, possibly one of the figures depicted on the Gundestrup cauldron. He has deer or stag antlers on the top of his head [adapted from Wikipedia].